"Future Flags of America Project: Study for 2050 U.S. 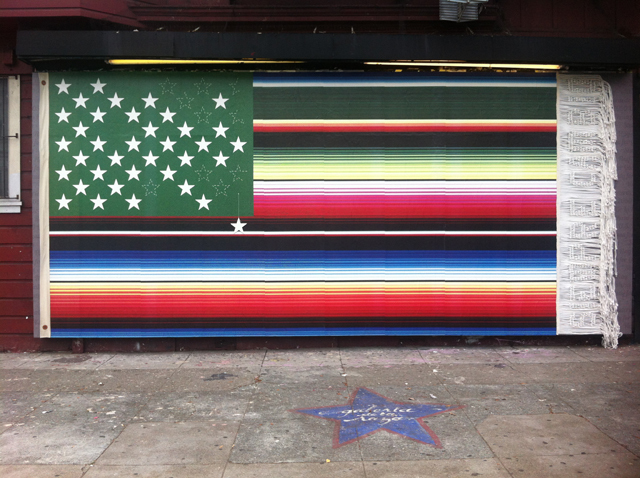 Flag"
Galería is pleased to present the newest installment of the Digital Mural Project with Victor De La Rosa. Is it possible to look at our past and our future at the same time? It can be startling or disturbing to do so – but if we consider incremental change in hindsight the inevitable is not so surprising... it can seem predestined. One by one human birth has shaped our world and defined time. Time ignores manmade borders and nationality is continually redefined. Are we in the middle of change that will only be recognizable when we look back at it in the future? Inspired by and utilizing U.S. Census and other demographic information, I propose this study for a flag that may represent the future of our nation as it changes in population. It represents a proposed eventuality of small incremental changes. Scale specifications "Study for 2050 U.S Flag" are also based on research of Title 4 of the United States Code which dictates the size and ratio of stars to star-field to stripe-field of the flag. Constructed and presented in a mid-process manner, the techniques used raise questions of whether the flag is being constructed or dismantled. With these pieces I want to give the viewer pause and fosters a moment for considering one’s values, beliefs and ideas about the future of our country. Victor De La Rosa works across a variety of media, both real and virtual – fiber, film, and digital – and has exhibited internationally. His filmmaking and film curatorial work has had international festival screenings in cities such as Berlin, London, Sydney, Hong Kong, and Tokyo, as well as cities across the United States. His work has been covered in leading field publications such as the Surface Design Journal and Fiberarts, and in consumer publications from The New York Times to Rolling Stone Magazine. De La Rosa’s regional, national, and international fine art exhibition participation include the Border Art Biennial / Bienal Fronteriza de Arte 2010, which is held concurrently at Museo de Arte INBA de Ciudad Juarez in Mexico, the El Paso Museum of Art in Texas, and the 3rd European Textile and Fibre Art Triennial in Riga, Latvia, in which he received a jury prize and was one of only three U.S. artists selected to participate. Before deciding to pursue a path to the professorate, De La Rosa spent many successful years as an apparel, product, and textile designer. De La Rosa joined the fine arts faculty at San Francisco State University in 2006 after teaching on the East Coast at the University of Massachusetts-Dartmouth, Philadelphia University, and the Rhode Island School of Design, the latter of which he continues to teach in the summer textiles program. He received a Bachelors of Art from San Francisco State University , a Masters of Fine Art from the University of California, Davis  and most recently, a Masters of Fine Art in Textiles from the Rhode Island School of Design , where he was a President’s Scholar and received honors including the Award of Excellence.